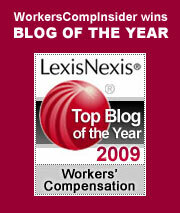 Just how much of a toll has the poor economy taken on the workers comp system? Robert Hartwig looks back and looks ahead in his article for this year’s NCCI Issues Report, The Great Recession and Workers Compensation: Assessing the Damage and the Road to Recovery (PDF). He notes that while the property casualty industry fared better than many industries – not a single property casualty insurer folded due to the economy vs the 170 banks that did – the industry still took some serious body blows. And of the damage to the industry, the workers comp line was hardest hit. With 7.1 million job losses, declining payrolls, and a continuing soft market, net written premium fell by a whopping $8.5 billion in 2008, with another steep decline anticipate for 2009. With a limited ability to grow exposures and greatly diminished investment earnings across all lines of insurance, especially especially longer-tailed lines such as workers compensation, the focus — at least for the first half of the 2010s — must be on underwriting profitability. Generating consistent underwriting profits is the only way to earn risk-appropriate rates of return in the current slow growth, low investment yield environment. What’s in the card for employers? Look for the potential of price hardening and greater selectivity on the part of insurers. Tight underwriting means that options may be limited for employers with poor experience. While it’s always important to control losses, this environment ups the ante. In particular, employers need to be taking steps to control losses as hiring ramps up: new and untrained workers experience more injuries than veteran employees. A recent article in Industry Week suggests that employers should make safety part of the hiring process: Hiring for Safety: Risk Takers Need Not Apply. In addition, employers should put a heavy emphasis on safety training for all new hires.